It will be OK. The Squid of Reassurance told me so. 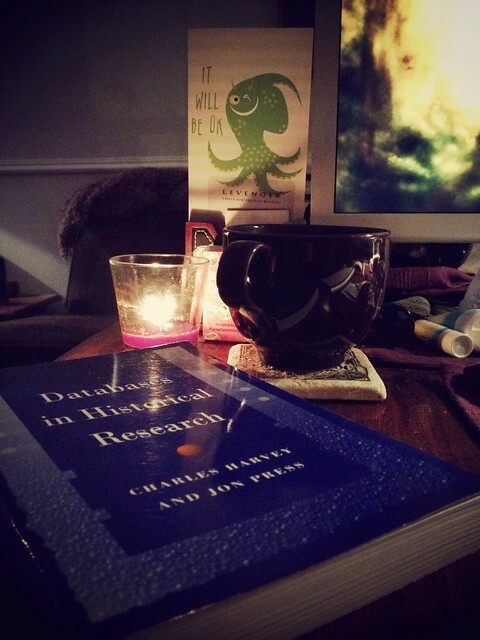 It will be OK because of other things, too, like meeting a new friend for coffee and fascinating chat, then coming home to cats who cuddled me while I dug into this book on databases in historical research. The aforementioned new friend introduced me to HabitRPG, which is a website that gamifies (still not sure how I feel about that word) good habits and task completion. It is just cute enough to be fun and just clever enough to be addictive. I wanted to reconsider my “good habit” list for the Routine Reboot, and HabitRPG encouraged me to do that. There are a few things I want to do every day — like writing Morning Pages — but end up making excuses for it instead of actually doing it. With HabitRPG, I get a bit of game XP (experience points) for doing so. I could even choose to set it up so that the game deducts XP if I don’t write Morning Pages, but I felt that was a bit harsh just starting out. I’m not sure how much I will use the to-do list aspect of it, because goodness knows I don’t need another fiddly-bit. But just a little time with the game encouraged me to think more positively about my daily life, and that is something I really need right now. ‹ PreviousRed wings and darker beak.